The POS Logix Sales Terminal system fully supports fingerprint user authentication and enrollment with the addition of a digitalPersona USB Biometrics reader. 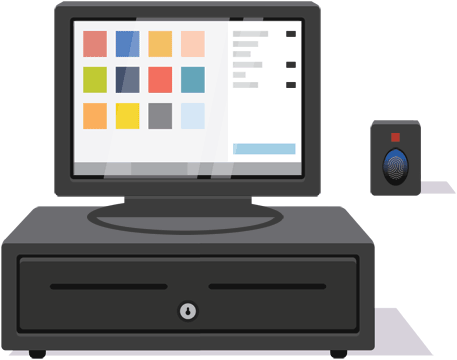 This allows each staff member to enroll two fingerprints on the system and use either one to sign on quickly and securely at any Point of Sale terminal. Biometrics hold a key advantage over PIN Code, iButton and Swipe Card authentication in that the user cannot forget their access codes, card or tag. Biometrics also add an additional level of security to Time and Attendance recording via the Sales Terminal system, ensuring that all staff members are physically on site to be able to clock-in.